It’s Friday the 13th in Estero and Fort Myers and i have quite frankly been SCARED by the conditions in our area the past week! If it wasn’t wind it was muddy water or a cold front dropping the water temps down. There was definitely alot of things working against fisherman and guides this week but despite the tough conditions we managed to do well and continue to put clients on fish. 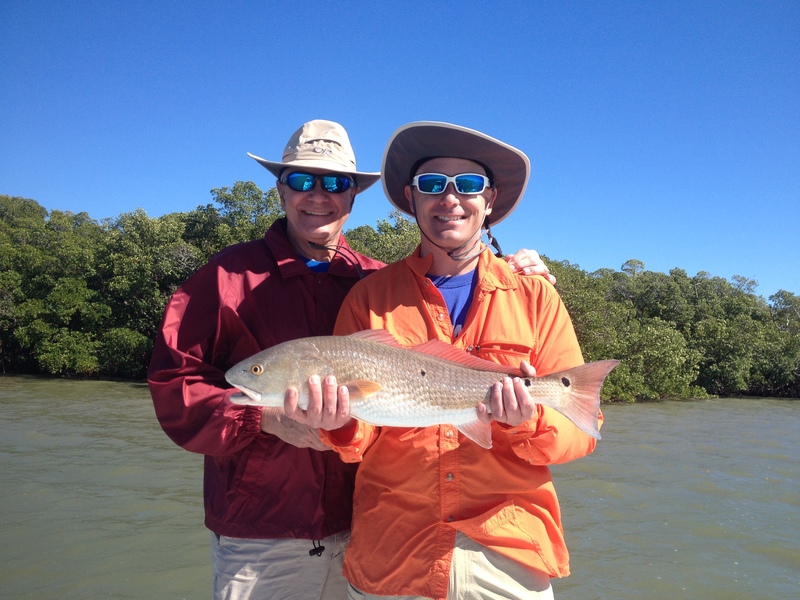 This week we caught Snook, Redfish and Trout with pretty good success. Yesterday alone i had two anglers fish with me and both of them caught the “inshore slam” which is all three species Snook, Trout and Redfish in one day. Not too bad for terrible conditions. I haven’t bothered fishing in the mornings and the earliest we have started is 10am. This gives time for the water to heat up but also it puts us in a position to take advantage of the incoming tide. The outgoing tides have been very unproductive lately so good guides will tailor each trip to give his clients the best opportunity to catch fish and that’s exactly what i have been doing. I have still been doing well with pilchards even though the water temps have dropped ten degrees this week. I always get shrimp this time of year though and they have been producing too. Either bait you use make sure you put a split shot on and pin the bait to the bottom. Fish can get lazy after cold fronts and don’t want to chase anything down. If a fat juicy pilchard is there sitting on the bottom right in their line of sight it’s hard for them to resist. Next week is going to warm up nicely and the tides will be good for being productive fishing. I was one of the anglers who caught the inshore slam on the 12th. Mark is an excellent guide, one of the best. We had a great time! Thanks Mark! Thanks Kevin for the kind words! Hope we can get out and fish again soon!